This educational wooden train jigsaw is perfect for young children that are learning to count. 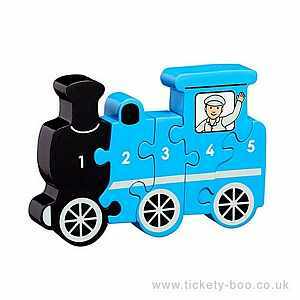 Children will learn the number sequence as they slot each interlocking piece of the puzzle together to form a train. A fair trade toy handcrafted from mdf. When you purchase a Lanka Kade product you directly support their Educational Foundation which provides several disadvantaged rural schools in Sri Lanka with books and daily milk to ensure that all students are better equipped for learning.